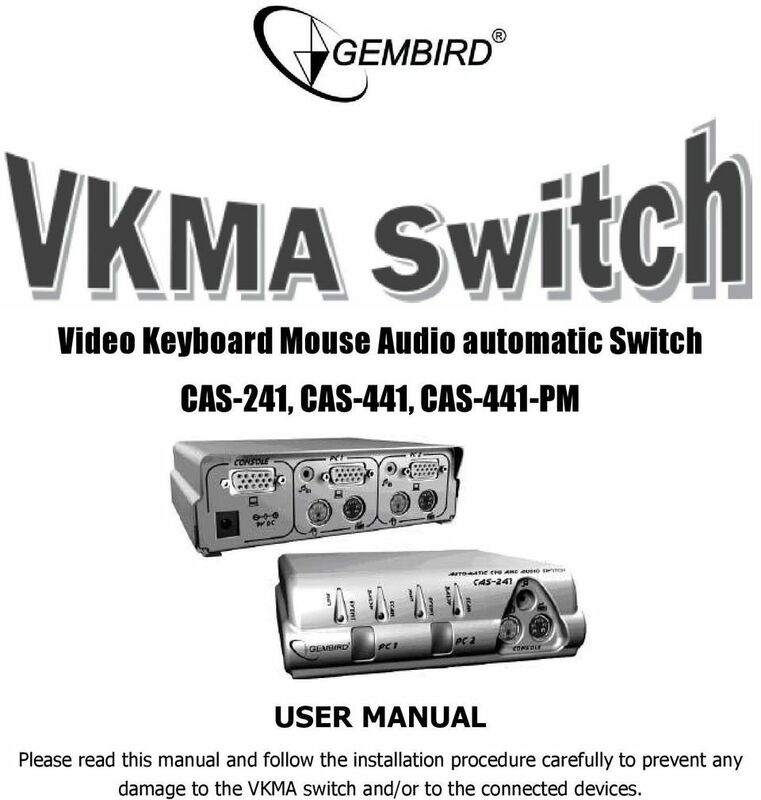 Download "Video Keyboard Mouse Audio automatic Switch CAS-241, CAS-441, CAS-441-PM"
1 CAS-241, CAS-441, CAS-441-PM USER MANUAL Please read this manual and follow the installation procedure carefully to prevent any damage to the VKMA switch and/or to the connected devices. 2 2 Disclaimer We spared no efforts to make sure that the information in this manual is correct and complete. However no liability is accepted for any errors or omissions. 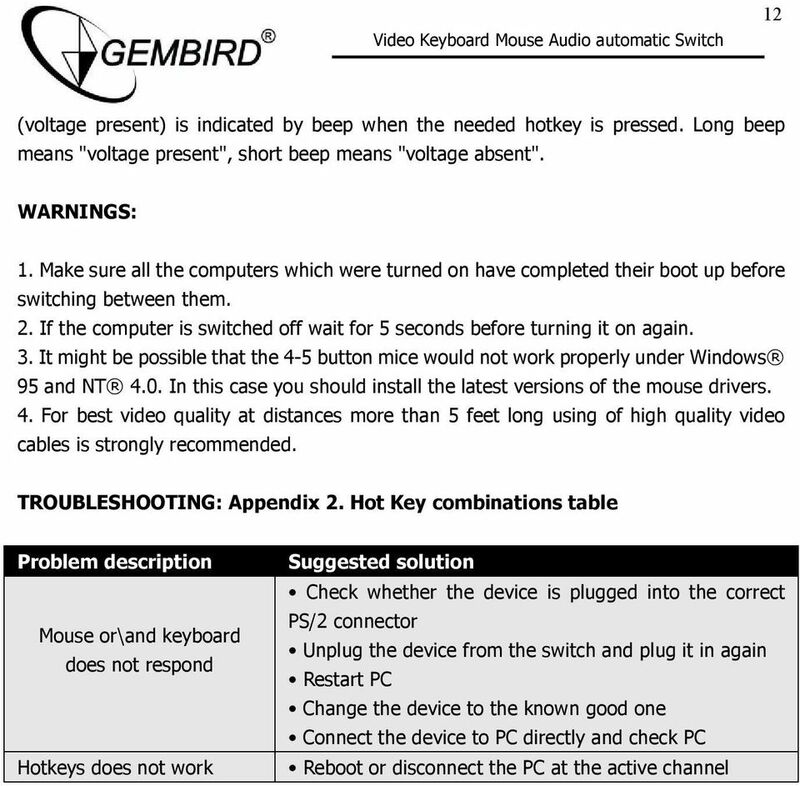 Gembird Electronics reserves the right to change the specifications of the hardware and software described in this manual without prior notice. 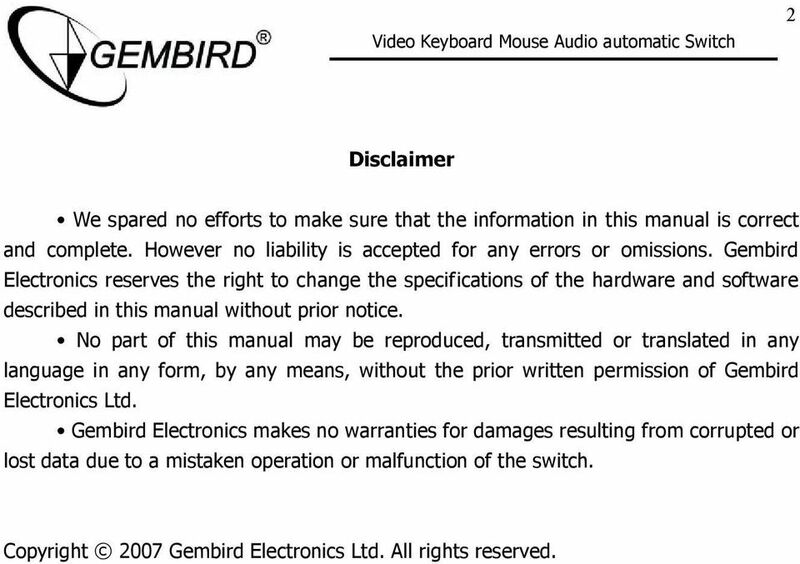 No part of this manual may be reproduced, transmitted or translated in any language in any form, by any means, without the prior written permission of Gembird Electronics Ltd. Gembird Electronics makes no warranties for damages resulting from corrupted or lost data due to a mistaken operation or malfunction of the switch. 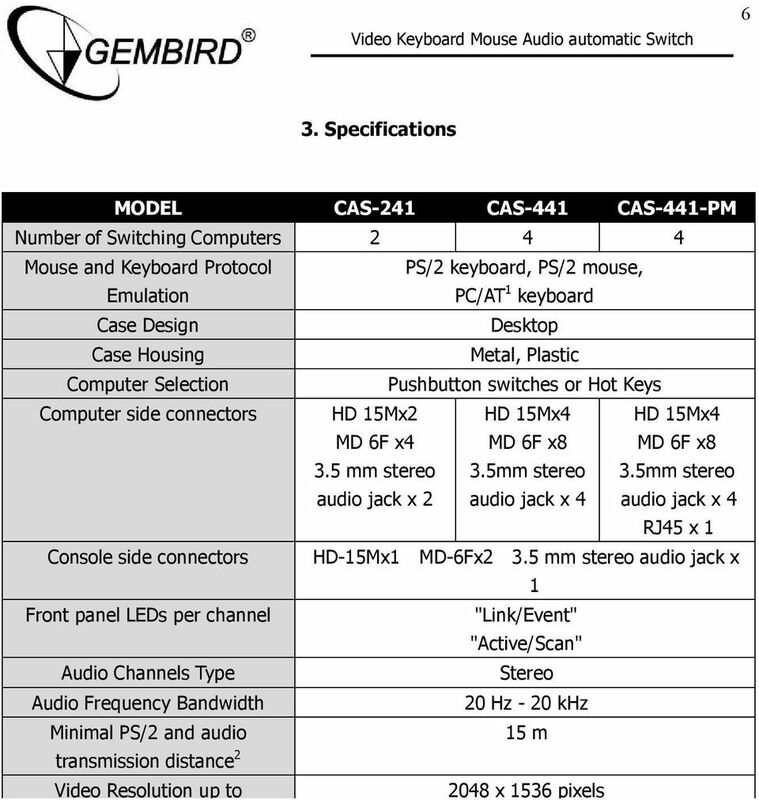 Copyright 2007 Gembird Electronics Ltd. All rights reserved. 7 7 Video Protocol DDC, DDC2, DDC2B Video Bandwidth 250 MHz Power Consumption From PS/2 PC ports, Spare AC-DC adapter +9V, 300mA 3 Dimensions (LxWxH), mm 146x35x45 245x135x45 245x135x45 Weight up to, Kg Notes: Connect PC/AT keyboard is possible trough an PC/AT-PS/2 adapter (not enclosed). Depends on quality of audio cables. AC-DC adapter is not enclosed, it may be necessary if PS/2 ports supplies other devices (external hard drives, etc) in addition. 4. Installation 1. Connect the console monitor to the switch first and power it on. 2. Connect the mouse and keyboard to the switch. 3. Connect the audio speakers to console audio out on the front panel. 4. Connect the AC-DC adaptor (9V 300mA) to the switch power jack and insert adaptor to the AC mains, if necessary 1. 5.Connect the computers (keyboard, mouse, VGA, audio connectors) to the switch by cables and turn them on. 6. Connect CAS-441-PM to SiS-PM-841 with Cat5 cable with straight-through pinout. 10 10 and keyboard without need to reset the VKMA switch and reboot computers connected. Note: 1. 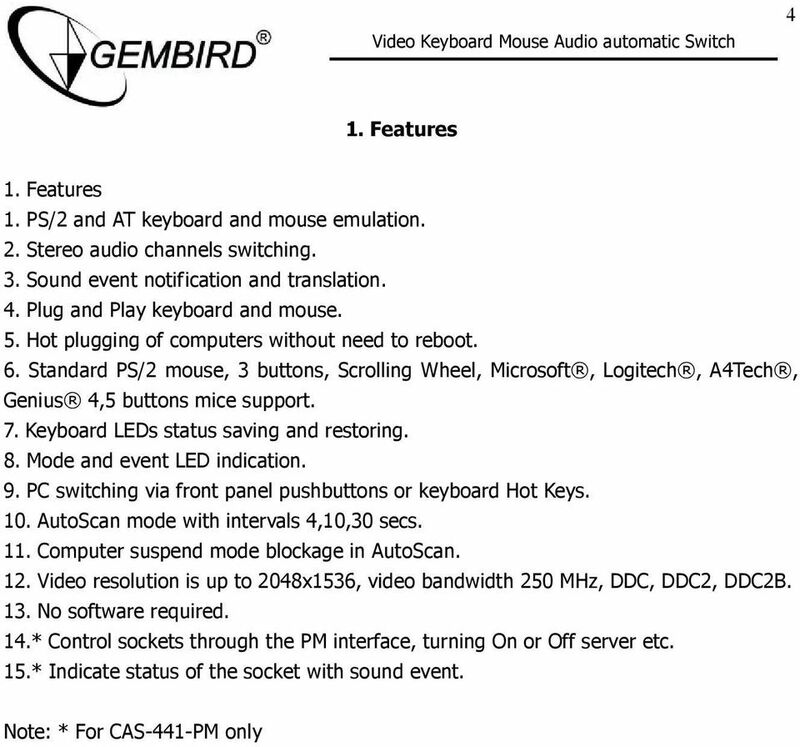 For full support of computer Hot Plugging, keyboard and mouse Plug'n'Play features use latest mouse drivers or Microsoft mouse drivers. 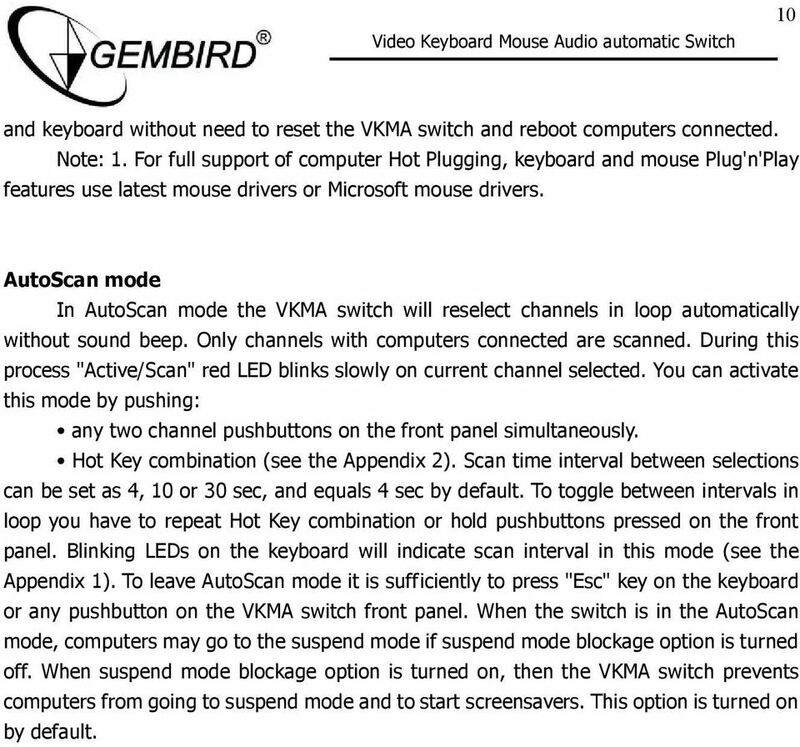 AutoScan mode In AutoScan mode the VKMA switch will reselect channels in loop automatically without sound beep. Only channels with computers connected are scanned. During this process "Active/Scan" red LED blinks slowly on current channel selected. You can activate this mode by pushing: any two channel pushbuttons on the front panel simultaneously. Hot Key combination (see the Appendix 2). Scan time interval between selections can be set as 4, 10 or 30 sec, and equals 4 sec by default. To toggle between intervals in loop you have to repeat Hot Key combination or hold pushbuttons pressed on the front panel. 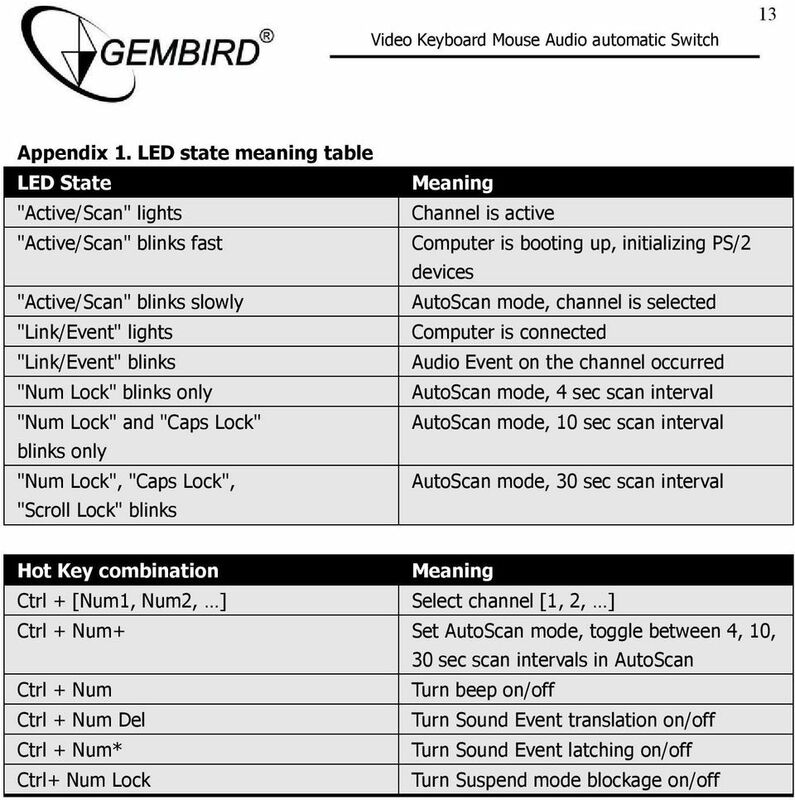 Blinking LEDs on the keyboard will indicate scan interval in this mode (see the Appendix 1). 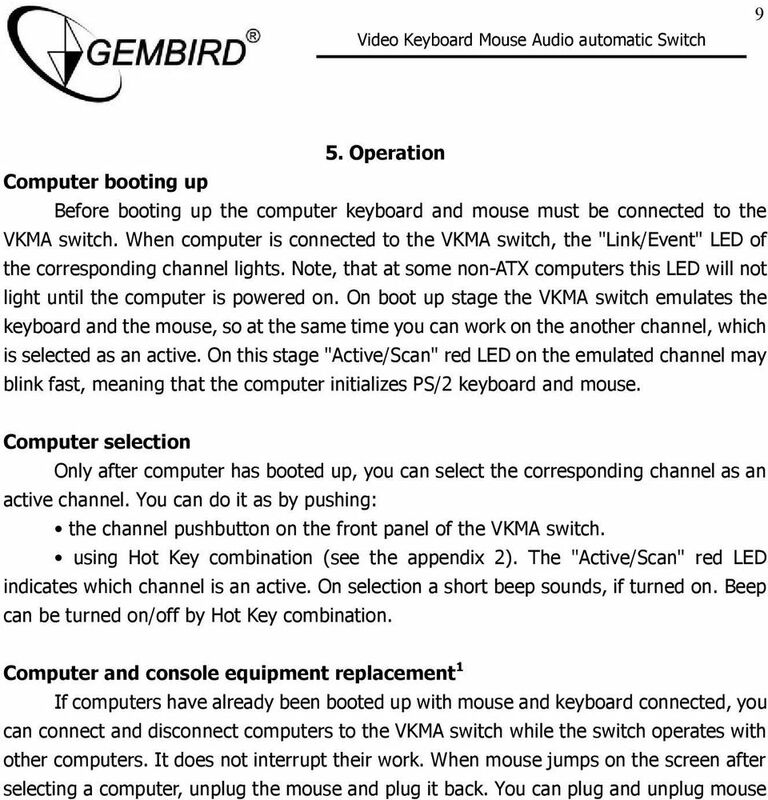 To leave AutoScan mode it is sufficiently to press "Esc" key on the keyboard or any pushbutton on the VKMA switch front panel. When the switch is in the AutoScan mode, computers may go to the suspend mode if suspend mode blockage option is turned off. 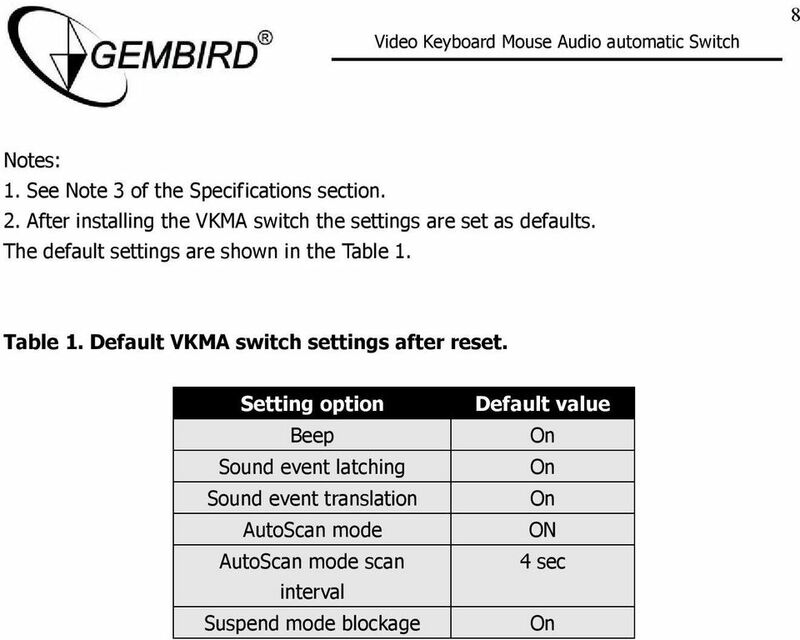 When suspend mode blockage option is turned on, then the VKMA switch prevents computers from going to suspend mode and to start screensavers. This option is turned on by default. 14 14 For CAS-441-PM only Press and hold 'Ctrl' then press and release Switch on the socket with [Ch N] number [Ch N] then press ' * ' Press and hold 'Ctrl' then press and release Switch off the socket with [Ch N] number [Ch N] then press ' - ' Press and hold 'Ctrl' then press and release Beep indicates the voltage state on the [Ch N] then press '. ' socket with [Ch N] number Note: 1. When option is toggled on a short beep sounds, and when option is toggled off a long beep sounds. 2. While sound event indicates the status of the socket: long beep means "Switched On", short beep means "Switched Off". 3. 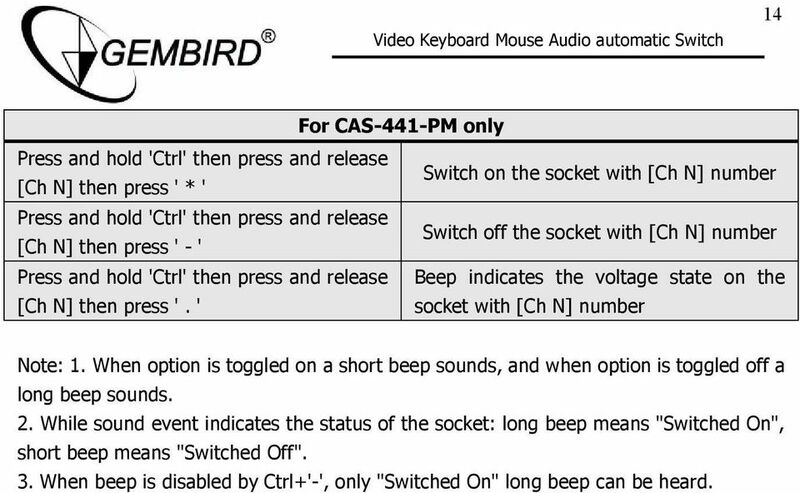 When beep is disabled by Ctrl+'-', only "Switched On" long beep can be heard. 15 15 6. Preventing Radio and TV Interference WARNING!!! 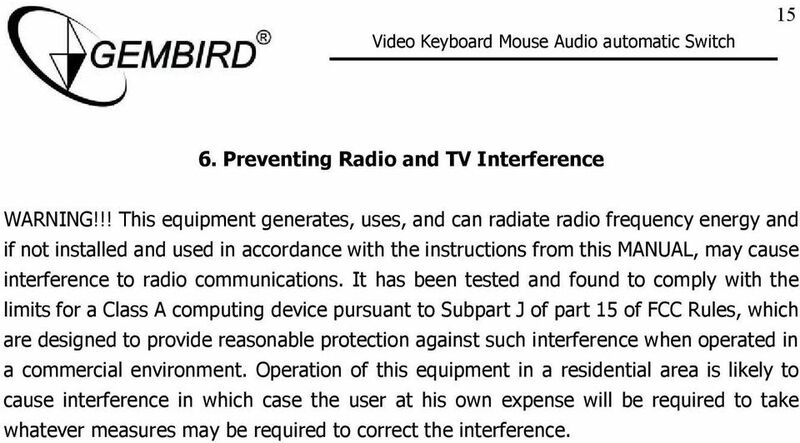 This equipment generates, uses, and can radiate radio frequency energy and if not installed and used in accordance with the instructions from this MANUAL, may cause interference to radio communications. It has been tested and found to comply with the limits for a Class A computing device pursuant to Subpart J of part 15 of FCC Rules, which are designed to provide reasonable protection against such interference when operated in a commercial environment. Operation of this equipment in a residential area is likely to cause interference in which case the user at his own expense will be required to take whatever measures may be required to correct the interference. User Manual ACS-1722 ACS-1724 Read this guide thoroughly and follow the installation and operation procedures carefully in order to prevent any damage to the units and/or any devices that connect to them. User Manual. Installation 4-Port USB Guide KVM Switch. 4-Port USB KVM Switch. www.iogear.com GCS634U. PART NO. Q1013-a GCS634UW6. Part No. MiniView Dual View USB KVMP Switch User Manual (GCS1742 / GCS1744) 1 Welcome Thank you for purchasing one of the industry s most feature-rich dual display KVMs, with USB peripheral sharing and audio technology. 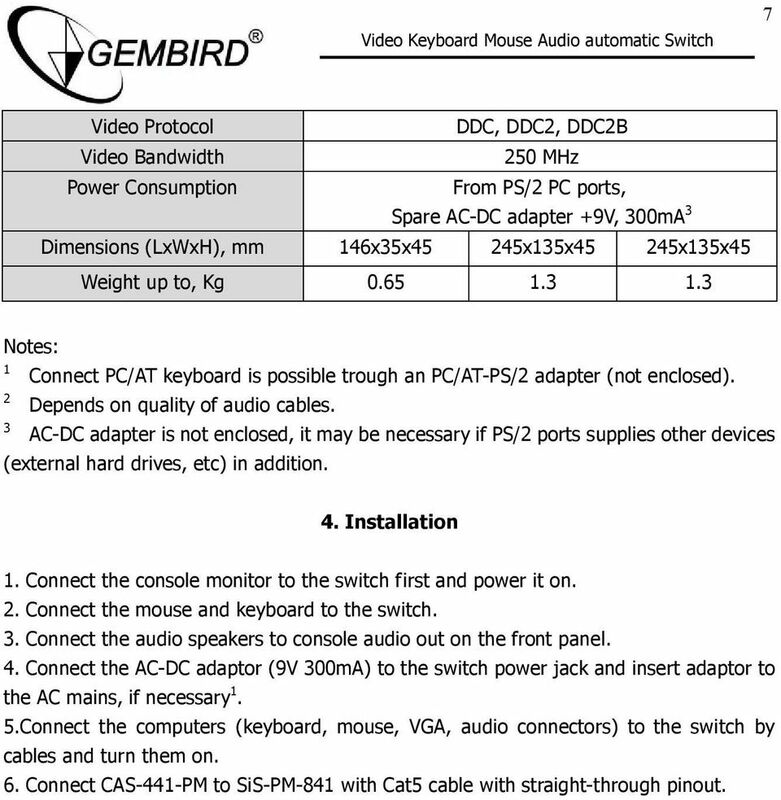 MiniView DVI 2/4 PORT USB KVMP Switch User Manual (GCS1762 / GCS1764) Welcome Thank you for purchasing one of the most feature-rich DVI KVM with USB peripheral sharing and audio technology on the market. ProConnect 4-Station CPU Switch Use this Guide to install: SVIEW04 ver. 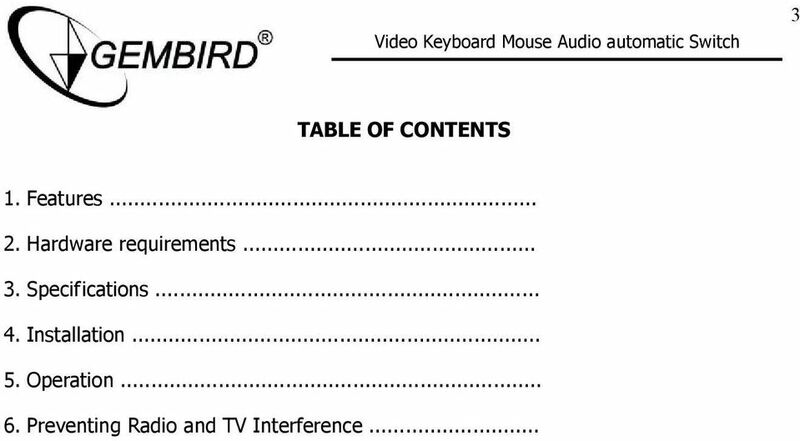 2 User Guide COPYRIGHT & TRADEMARKS Copyright 2001 Linksys, All Rights Reserved. ProConnect is a registered trademark of Linksys. 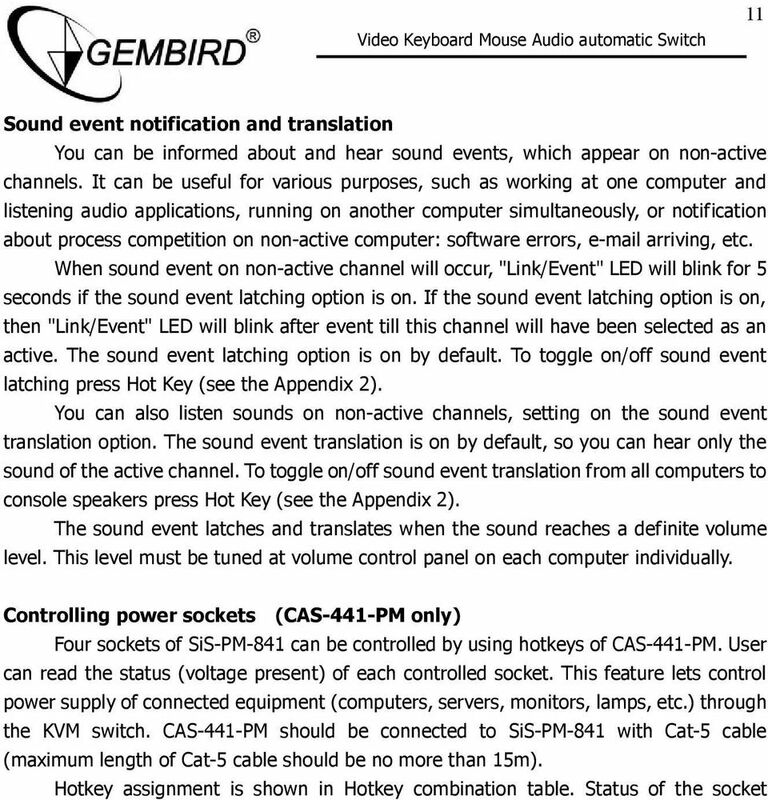 User Manual CS-1742 CS-1744 FCC Information This is an FCC Class A product. In a domestic environment this product may cause radio interference in which case the user may be required to take adequate measures. RALOY. Slim 1U Rackmount LCD Monitor. 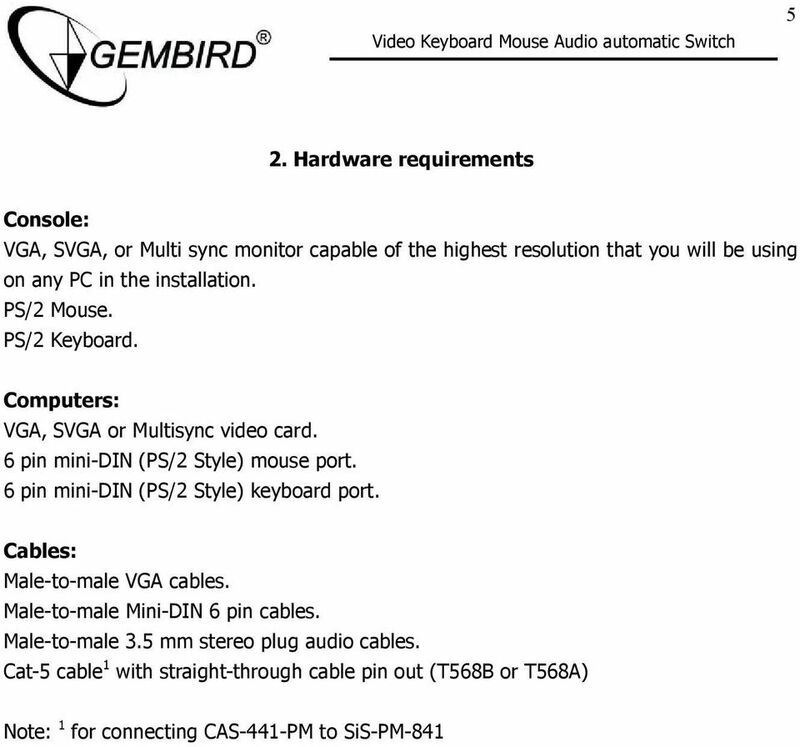 Optional KVM Switch R A C K M O U N T C O N S O L E S USER MANUAL. Features. Dual View The Dual View function provides support for two displays. USB KVM Switch with Audio & Ethernet Hub FCC Compliance Statement This equipment has been tested and found to comply with the limits for a Class B digital device, pursuant to part 15 of the FCC Rules. Warning! It will cause malfunction if the AV Adaptor is operating with unspecified power supply adaptor or incorrect power voltage. 8 Port KVM Switch with Remote IP Access StarTech ID: SV831DI Perfect for mission-critical server rooms or datacenters, the SV831DI is an all-in-one solution for effective and efficient network management.